AWESOME ABS: Abdominal exercises and lower back conditioning. ADVANCED YOGA: A one and a half our flow class focused on listening to your body while going at your own pace. Daniele will offer you variations on poses while encouraging you to listen to your body. Which could translate into hovering in handstand or resting in child. Class will begin with meditation and end with poses on the floor. You will feel both refreshed and renewed. BARRE: A fun workout that fuses fitness techniques from Pilates, Yoga, and Dance that will tone, strengthen and chisel your whole body. These classes do not require previous experience although they are a challenging workout designed for intermediate/advanced skill levels. The method used includes the perfect combination of movements and techniques to increase strength, flexibility, and burn fat efficiently with cardio segments. BELLY DANCING: A fun, low impact workout that increases flexibility and mobility through dance. ﻿​BOOT CAMP: Join Certified Instructor Kyle Hyde for a new spin on indoor Boot Camp. This high-energy class will challenge you to improve your core, cardiovascular and muscular strength and endurance to help you build lean muscle and burn away fat to achieve the physique you desire. All fitness levels welcome. FUNCTIONAL FITNESS: A variety of equipment will be used to improve posture, mobility, strength and balance. An excellent class for our senior participants but open to all ages. FULL BODY WORKOUT: High energy step combinations combined with interval and body sculpting. GENTLE YOGA: Release tightness and enhance your range of motion with gentle, gravity based Yoga poses. No previous experience necessary; open to all levels. INTRO TO YOGA: If you’re new to Yoga this is for you! Gentle stretching and poses to relax and renew. Kickboxing Level 1: An intro level class where you will practice kickboxing fundamentals and basics in a timed round-based set. All levels welcome. Kickboxing Level 2: A faster paced, more technical kickboxing class where the rounds are harder, faster, and require higher proficiency. Previous experience or Kickboxing level 1 recommended. Kickboxing All Levels: A more straightforward cardio class where the pace is higher and the emphasis is on fitness rather than technical improvement. All levels welcome. NIA: Nia is a form of fitness fusion combining dance with martial arts and healing art forms such as yoga. A one hour rhythmic routine provides the perfect balance of high energy cardio mixed with a lower intensity, mind/body/spirit beginning and cool down. ﻿​NRG BAR: Barbells, dumb bells and steps are used through systematic sequence of exercises. Every muscle group will receive a workout in this INTENSE strength training/cardio class. ﻿​PILATES: Excellent strength and conditioning class based on Pilates method. Please come to class warmed up. POWER YOGA: Come alive during this 60 minute power vinyasa class by moving through intermediate/advanced yoga flows. The music used in class is a little hip hop and R&B, so get ready to get down. ﻿​SERIOUS SCULPT: An intense body conditioning class using weights, bars, tubing and more. This class is not only physically challenging but mentally stimulating. SILVER POWER: The Silver Power class is a strength and movement class for people over 55, which involves un-weighted calisthenics, balance movements, light weight exercises, individualized cardio. It ends with ab work and a stretching cool down. ﻿​STEP & SCULPT: A class designed to teach you safe, effective and easy to follow step patterns. This class is for ALL levels of fitness – beginning and advanced steppers. A strength and flexibility segment will be included. STEP JAM: A variety of choreography and step combinations will be used in this intermediate to advanced step class. Your mind will stay busy and your heart will keep pumping in this fast paced class. ﻿​TABATA HIIT – Take your fitness program to the next level with this high intensity interval training class. This class will target multiple muscle group, build endurance, and make you sweat! Each class will include Tabata training, which consists of 4 minutes of intervals – 20 seconds on, 10 seconds of recovery, 8 rounds. 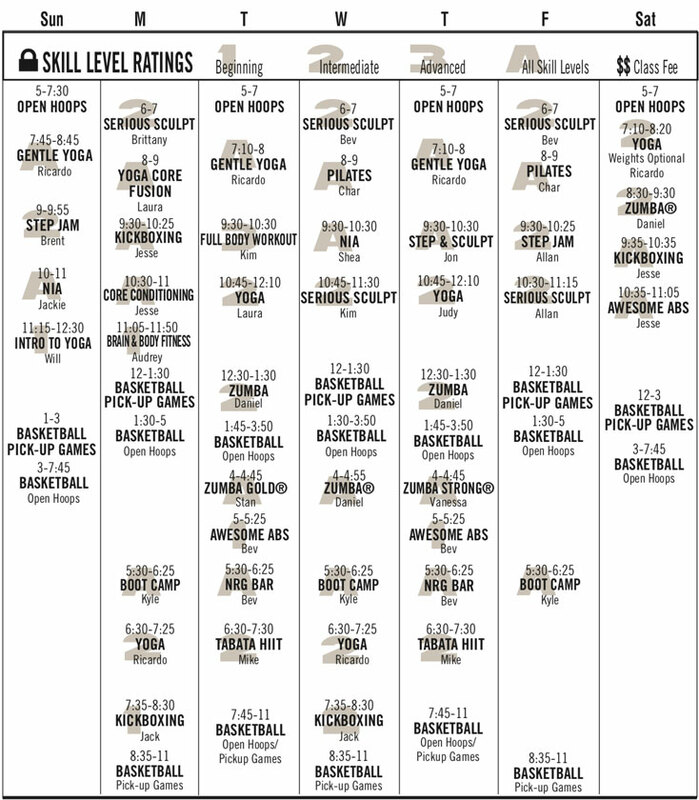 If you want to mix up your fitness routine this is the class to try. This class is designed for intermediate to advanced participants. ﻿​TAI CHI: You will blend a variety of movements from the martial arts to improve your balance, strength and flexibility. YOGA: Vigorously warms, strengthens and stretches the body through flowing rhythmic sequential movements..
FUSION: This classes fuses intense core work with yoga for an amazing workout. A variety of equipment will beused. All levels of fitness are encouraged to attend. ZUMBA®: A fusion of Latin and International music that will create both a dynamic and exciting workout. 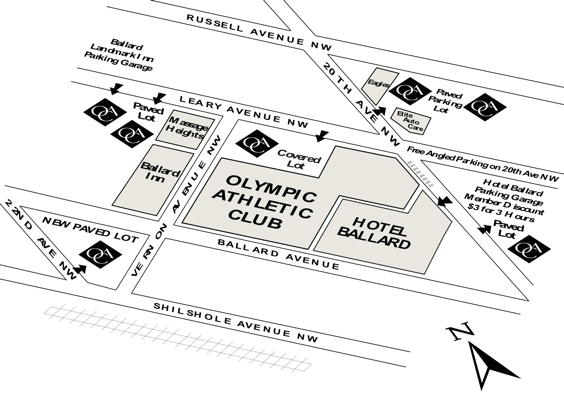 Olympic Athletic Club offers 5 customer parking lots where members can park for FREE during Club use. However, valid OAC parking permits are required and MUST be displayed. For more information about member parking or to obtain an OAC parking permit, please speak with one of our staff members at the front desk. © 2019, Olympic Athletic Club. All Rights Reserved.